We, militants of the Confederation of Revolutionary Anarcho-syndicalists (Section of the International Workers Association in Russia) are in full solidarity with the residents of Khimki and with environmental community, who protest against the barbaric destruction of the forest Khimki during the construction of railroad route. We consider for intolerable that the city authorities are using gang of neo-Nazi thugs to fight the defenders of the forest. Recognizing the validity and fairness of civil resistance, we warn at the same time against any attempts to translate an just public outrage in the nationalist channel. 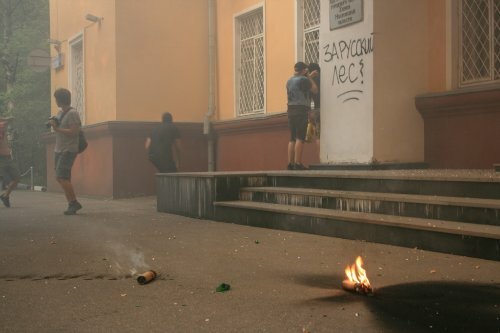 In this regard, we are appalled that in the recent protests in front of Khimki Administration, some persons acting on behalf of the «anti-fascists» and «anarchists», chanted chauvinistic slogans in support of the «Russian» forest, unfurled banners, deliberately written in Church Slavonic fonts, and called the current power «occupational», like German Nazis in 1941. We are confident that our environment does not belong to any individual «people» or «ethnicity», but is the common heritage of mankind and the key to its survival. Calls to protect «Russian» forest from certain alien invaders (as implied, «non-Russian») only fueled the nationalist sentiments and are completely unacceptable in the mouths of people who consider themselves «anti-fascists» and, moreover, anarchists! We are outraged by the attempts of people, borrowing nationalistic slogans, to use for self-promouting the name of Stanislav Markelov who was a convinced antinatsionalist. We remember that in the pages of the «Red Book of Antifa» Stanislaw called leftists to abandon patriotic phrases. Attempts to invoke his name in the course of action under nationalist slogans are not allowed. OUT THE NATIONALISTS FROM SOCIAL MOVEMENTS! NO WAR BETWEEN PEOPLES - NO PEACE BETWEEN CLASSES!